On the outskirts of west Belfast in Northern Ireland, and in the shadow of the Black Mountain, is situated the predominantly Catholic community of Andersonstown. Between November 1971 and March 1972 this small area of land, which is just two miles long by one mile deep, became the scene of many gun-battles between the men of 9(Plassey) Battery, Royal Artillery and 1st Battalion Belfast Brigade, Irish Republican Army. This book is a record of the violent clashes which took place on an almost daily basis on housing estates which looked no different than those found on mainland Britain. After the events of ‘Bloody Sunday' in Londonderry on the 30 January 1972 in which thirteen civilians were shot dead, the attacks against the soldiers intensified to an unprecedented scale. The whole community of Andersonstown appeared to rise up against the small band of men from 9 Battery. There are truly terrifying accounts from twenty of the men who took part in the struggle to maintain the peace on the streets of Andersonstown. They describe how it felt to face the rioters, and how it felt to be under attack from the Provo gunmen. Contemporary newspaper reports have been used to illustrate the viewpoints of both sides involved in the conflict. The book contains many recently discovered photographs of the arms and explosives found by the battery in their searches. None of these images have ever been published before. There are also reproduced statements issued by the Provisional IRA which originally appeared in the ‘Volunteer' news sheet issued around the estates, and these serve to corroborate some of the astonishing tales told by the soldiers. This is the only book about the Troubles in Northern Ireland which covers just one single tour of duty as seen through the eyes of the men who were there. 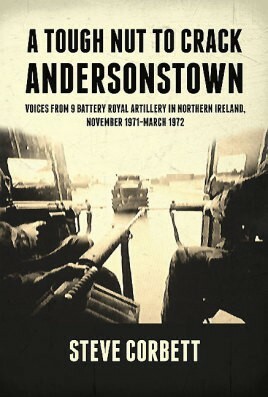 By the end of the tour in March 1972 the IRA in Andersonstown had been almost completely destroyed as a fighting force. The 110-strong unit of men of 9 Battery were given a task to do, to crack The Toughest Nut - and they gave it their all.